As I mentioned in my pathetic pizza lunch post last week, I was off on a trip and left my ten-year-old in charge of making lunches for himself and for Paige in my absence. So I came to terms with the fact that convenience may win out this round, and I would just pick up a box of those smuckers suckers and be done with it. At the grocery store I saw there was a whole wheat bread option of them. Awesome. Then I saw there was also a reduced sugar option. Looking good! I grabbed a box out of the freezer and notice there are only four in the box. Hmmm. I look at the price. Almost a buck each. Seriously? Finally I flip the box over and scan the ingredients....not one, but both of my big no-no's jump out at me from the list, one right after the other: HIGH FRUCTOSE CORN SYRUP, PARTIALLY HYDROGENATED SOYBEAN OIL. Ugh. I put the box back in the freezer and hoofed it straight to the bread aisle. *side note: this "jelly" is organic fruit spread from Trader Joe's. It's a blend of cherry, red grape, blueberry and pomegranate called Super Fruit and it's DELICIOUS. Seriously, I'm really not a jelly fan at all and I love this stuff! If you have a Trader Joe's and need some yum in your life, try this out! 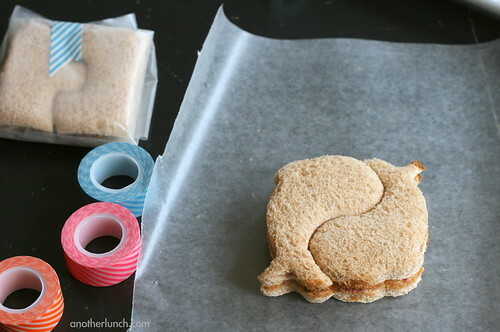 ** second side note: obviously, using sandwich cutters are not mandatory, but they sure are cute. I was going to use my Pampered Chef sandwich sealer, but for cuteness sakes I grabbed a handful of some favored Lunch Punch cutters instead. 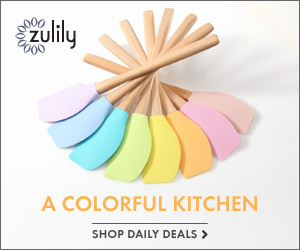 Step 1: make your sandwiches. If you put peanut butter on both sides of the bread with the jelly in the middle it will help your bread from going soggy. Step 2: flash freeze your sandwiches. I'm not sure if this is totally necessary, but I was afraid if I wrapped them prior to freezing that moisture may collect inside the wrapping and form ice crystals...which would later melt when the sandwich thawed and potentially make the bread soggy. 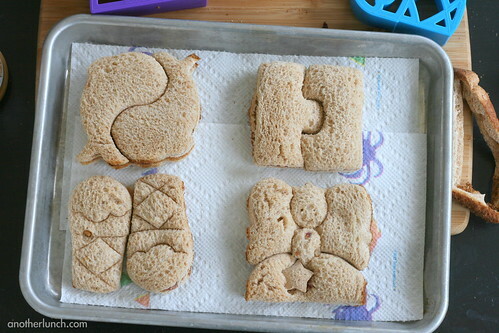 So I just laid my sandwiches down on a small baking sheet and stuck them in the freezer for 30 minutes. That was long enough to partially freeze them, but not too long to risk freezer burn. My baking sheet has a lid which I placed on top slighty askew. If I didn't have this lid I might have tried laying a piece of wax paper loosely over the top or maybe even a clean dish towel, just to protect from the freezer without totally sealing in any moisture (sealing it tight might negate the benefits of the flash freezing). Step 3: wrap the sandwiches. I chose to wrap the sandwiches in waxed paper. I secured the waxed paper with washi tape (a decorative paper tape that's all the rage in craft and scrapbooking). And that's it! 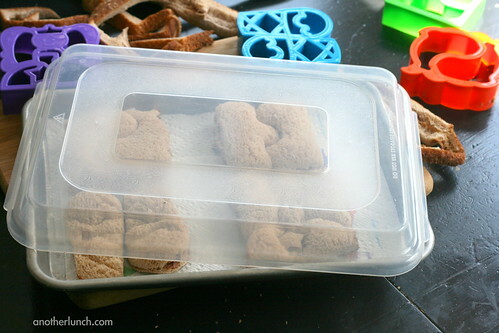 When it's time to pack up the lunch box one of the frozen sandwiches can go straight in to the lunch box or bento container from the freezer. The sandwich will thaw in a couple hours and be good to eat! This little freezer stash got my kiddos through my absence (along with two days they bought lunch in the cafeteria). Ethan thought it was pretty cool he just had to grab a sandwich pack from the freezer. Paige thought it was pretty cool too because she told me when I got home, "mama, Ethan made me really cute sandwiches with shapes and he wrapped them up in special paper with your fancy picture book tapes! Like a present!" I love how you use cute washi tape! Pinning this now! thanks! Tigger Em - plus, waxed paper can then be used again to wrap the next sandwich... you can just wipe it off if it's a different type sandwich... or it makes a nice place mat! 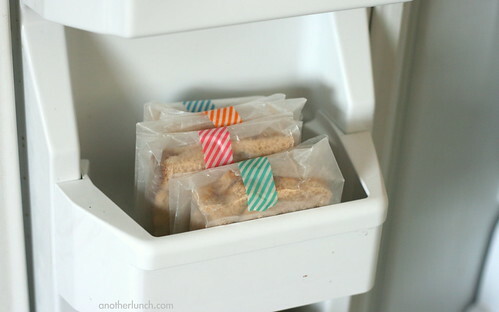 I love this idea... not just for planning ahead (and that alone is great) but because it makes packing cute lunches easier for working moms... just make the sandwiches on the day off, freeze, then one less thing to do during the week! BRILLIANT!!! 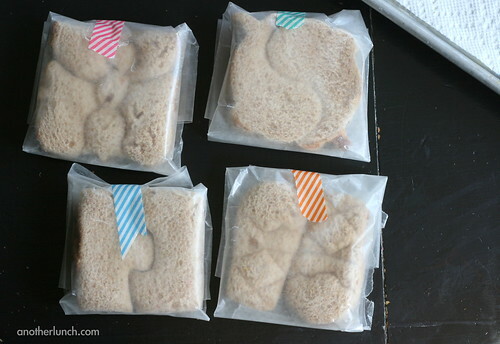 I can see doing this and just separating the sandwiches with waxed paper inside the sandwich bag (like deli sliced cheese). 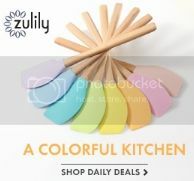 I was trying to figure out a way to do meal prep on the weekend for a particularly busy week/lifestyle. This just might fill the bill. That is a fantastic idea! And so much better than the uncrustables. Super cute! If you remember, I won the LunchPunch set a couple of years ago. Since then we have purchased all of the sets. But mind don't always look as nice as yours? Maybe you should do a quick tutorial on how yours look so fab and the jelly doesn't squeeze through? Love freezer sandwiches! I need to get some of that super fruit spread it sounds delicious! 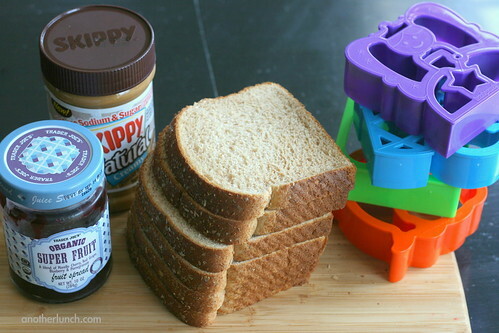 I'm surprised your kids are even allowed to take PB sandwiches to school. Mine arent allowed to have any nut products whatsoever. Amy, I know a lot of schools don't allow nut products... I am SO thankful our school hasn't gone that far (yet). There is a "peanut free" table in the cafeteria, but that's it. The lunch line even offers the packaged pb&j sandwiches as a substitute for whatever the main entree is that day on the lunch menu. There are times my kids attend places that do not allow nuts, such as our local drop-in childcare centers and the gym childcare rooms... in those cases I'll substitute sunflower butter for the peanut butter when needed. Oh drat... 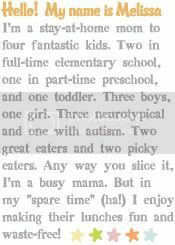 I was enjoying your blog until I felt like you were knocking kids with food allergies. Knocking kids with food allergies? Heck no! I'm sorry I gave you that impression. ? ?